Samsung Electronics, the world's biggest mobile phone and TV maker, has forecast weaker-than-expected profits for the April to June quarter. It has estimated an operating profit of 9.5 trillion won ($8.3bn; £5.5bn) for the quarter. Most analysts had expected a figure closer to 10.1tn won. The success of its smartphones has been key to Samsung's recent growth. However there have been concerns that its growth rate may be slowing despite the launch of new models. Samsung shares fell 3.8% after the profit guidance. Its shares have dropped more than 15% since early June, after a various brokerages downgraded their outlook for the firm. "The slowdown in its handset business appears to be worse than expected and the disappointing result simply reinforces the market view that Samsung's smartphone growth momentum is slowing," said Lee Sei-chul, an analyst at Seoul-based Meritz Securities. Samsung has enjoyed tremendous success in the smartphone market in recent years. 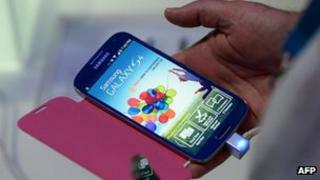 The popularity of its Galaxy range of smartphone saw it replace Nokia as the world's biggest mobile phone maker last year. According to research firm Strategy Analytics, Samsung accounts for almost 95% of the Android smartphone sector's profits. But despite all that success, there have been concerns in recent weeks that the rate of growth that Samsung's smartphones have enjoyed in recent years may be slowing, a trend that may eventually hurt profits. Earlier this month, South Korea's Woori Investment & Securities cut its earnings forecast for the technology giant. That was followed by similar moves from JP Morgan, Goldman Sachs, Merrill Lynch and others. The concerns have been triggered in part by the launch of new products from rival manufacturers as well as relatively low-cost smartphones by Chinese firms. Analysts said that for Samsung to be able to maintain its high growth rate the firm needed to come up with new and innovative products and also reduce its reliance on the mobile phone business to drive growth. "One of the biggest risks for Samsung Electronics going forward is that 70% of total operating profit comes from mobile business," said Jeff Kim of Hyundai Securities. "Diversification is key. Wearable devices are the next stage in a saturated industry that needs constant innovation to survive. "We'll see flexible smartphones in the fourth quarter from Samsung and LG Electronics, and iWatch and Galaxy Watch are expected to be one of the first waves." However, some analysts were sceptical about whether wearable devices would bolster earnings. "It's more likely to complement its earnings at best," said Byun Han-joon, an analyst at KB Investment & Securities. Jung Sang-jin, a fund manager at Dongbu Asset Management, added: "The problem is no one is sure whether these products can really wow investors and consumers." Samsung: Is the smartphone-maker in deep water?